Justin Conrad is Associate Professor of Political Science and Associate Professor of Public Policy at the University of North Carolina at Charlotte. Dr. Conrad studies international security issues, including terrorism and interstate conflict. His research is funded by the National Science Foundation and the Department of Defense, and his work has been published in leading academic journals, including International Organization, the Journal of Politics and the British Journal of Political Science. 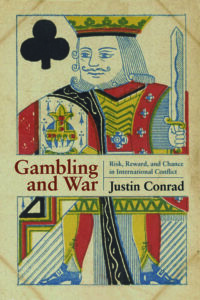 He is the author of the new book, Gambling and War: Risk, Reward, and Chance in International Conflict. Dr. Conrad has appeared in, and his research has been cited by, a variety of international media outlets, including the Washington Post, Los Angeles Times, Newsweek, Slate France, Salon, and Voice of America. Dr. Conrad is also a key researcher at the Resources and Conflict Project, and Associate Editor at Conflict Management and Peace Science. Professor Conrad received his Ph.D. from Florida State University and a master’s degree from UCLA.